Kelvin High School - Skylar was team captain, and lead all defenseman in regular season points. 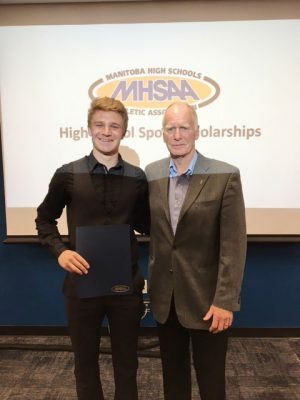 He was selected to the Winnipeg Sun's Top Ten, the Platinum Division All-Star Team, and the Manitoba High School Hockey Elite Team. He maintains an academic average of 92% while also participating in track and field, and cross country. He also participated at the 2017 Ice Cross Downhill World Junior Championships. Skylar is a Grade 9 mentor and organizes and runs Grade 9 orientation day. He is Master of Ceremonies for Kelvin Media Events, played the lead role in the schools musical, is a member of the school choir and band. He volunteers for Habitat for Humanity and assists at special events at his local community center.